For the past four years, the Turpin Cardinals have been in the playoffs. Turpin has solidified under sixth year head coach Justin Hannah into a solid team year after year. This year’s Turpin team has four starters back on both sides of the ball. There are 19 out for football at the class B school. And the word out of the Cardinal camp is that Turpin may have more speed this year than last. Turpin has good numbers in the senior (6) and freshman (8) classes with small junior and sophomore classes. Turpin was 5-6 last season. 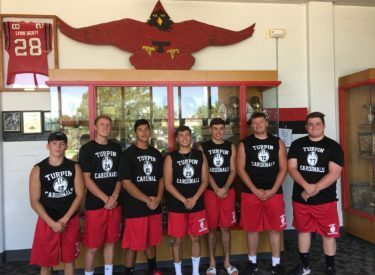 Some of the key Cardinals this season are Sr. QB/S Isiah Villalobos, Sr. OL/DL Trevin Watson, Sr. TE/DE Alex Lopez, Sr. WR/S Trent Weber, Sr. RB/LB Noah Garcia, Sr. OL/NG Joshua Heitschmidt, and Sr. WR/CB Rene Mendoza. Turpin was featured during the Sportsguys Thursday morning.